After-sales service:A no-risk return policy for 30 days guarantee,If you have any problem ,feel free to contact us. A detailed description:Our necklace may not be the most expensive one, maybe not the best one, but it might be one of the best for you. 1) No wearing it while sweating too much. 2) Avoiding the chemicals and being impacted. Basic Description:Metal Type: Alloy (NOT EASY TO GET SKIN ALLERGY ); Weight: 15Gram/Pc; Length: Adjustable 350mm+60mm. Come with a 7.5*7.5*3.5cm gift box. Design Concept:Virgin Mary is known as the protector of life and family. The Simple Virgin Mary necklace is an elegantly understated way to express your loyalty and devotion. 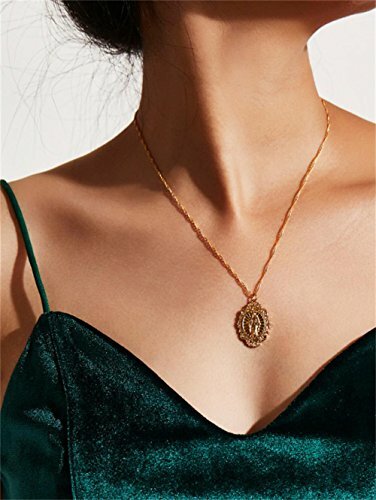 Use Occasion:The necklace is full of religious style,whit unique amorous feelings, suitable for any occasion, with all kinds of clothes, and can be a gift for friends, family and lovers. Packaging and After-sale Service:We offer exquisite package.If you have any question please feel free to contact us .We will respond within 24 hours. If you have any questions about this product by mnefel, contact us by completing and submitting the form below. If you are looking for a specif part number, please include it with your message.